Also comes inAdult Standard and Kids. It's hard to imagine the Mad Hatter as a particularly dark fella. Sure, he's stuck in a never ending time loop, constantly going from one tea time to the next for eternity, but at least he throws a killer tea party while he's at it. 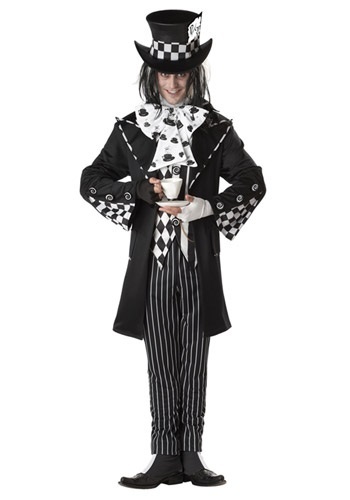 But if you prefer the gloomier side of fairy tale characters, this Plus Size Dark Mad Hatter Costume is just the dark look for you to wear to your own tea party! Have a blast coming up with your own origin story when you're dressed in this whimsical ensemble. It comes with everything you need for your own mad look, including pinstriped pants and a stylishly gothic overcoat and top hat, along with a huge floppy bow tie and shoe covers. This makes a perfectly macabre addition to a dark Wonderland group costume, and you can show everyone how a real “mad” hatter parties!